Time blocking is your secret weapon to get more DONE. No more getting distracted throughout the day—this powerful productivity technique keeps you laser focused! After months of seeing unchecked tasks on my to-do list at the end of the day and making hardly any progress toward my long-terms goals, I knew something had to give. I was making all the plans and writing all the lists, but it took just a few phone calls, texts, emails, and—yep—even family members to interrupt my productivity flow. I often scratched my head at 10pm, wondering where the day went and how I had managed to accomplish so little! A friend recommended I try time-blocking and the efficiency nerd in me jumped at the chance to give this productivity method a shot. Because the results? They spoke for themselves. She accomplished more in a day than I was in a week. And while I definitely don't have the unlimited energy she has (let's just be real), I made MORE progress than I ever did before just by implementing this simple technique. A basic definition of time blocking is “blocking off” a time of day to accomplish a certain task. It's that simple! You can do this by assigning a task to every hour of each day, or blocking off 2-3 hours at a time to tackle different projects or categorized tasks. Before I was writing my to-do lists without an overarching strategy—so every task looked like a priority. It was difficult to decide what to do because there was no rhyme or reason to what I wrote down. Plan more easily because I knew exactly what to do and when. Say goodbye to distraction and focus my attention on one task until it was complete. Be more efficient. With a set time to batch similar tasks, I didn't have to spend extra time shifting out of one “task type” and into another. In other words, with time-blocking, you become proactive about your time. Rather than living each day reacting to all the balls thrown your way in the form of emails to answer, random tasks to handle, etc. Take a look at the types of tasks (or events or responsibilities) you have each week and group them into similar categories. For instance, you probably deal with all or a combination of these categories in any given day: Housework, errands, work, school, etc. But don't forget to make room for your goals too! 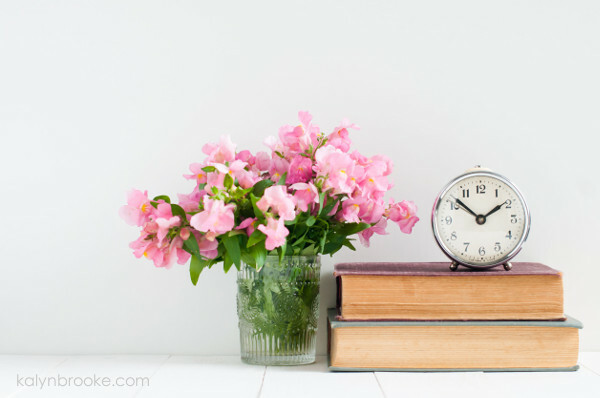 If you have a project you want to finish, a book you want to write, or a fitness program you want to complete, schedule time blocks to work on those and see just how much progress you can make toward your goals when you schedule time for them! The Strategic, Buffer, and Breakout Blocks are terms based on The 12-Week Year by Brian P. Moran (which I highly recommend!). Warning: Time blocking doesn't work if you don't actually block off the time. So after you've specified your life categories, the next step is to create your ideal schedule, which should include all your blocks. 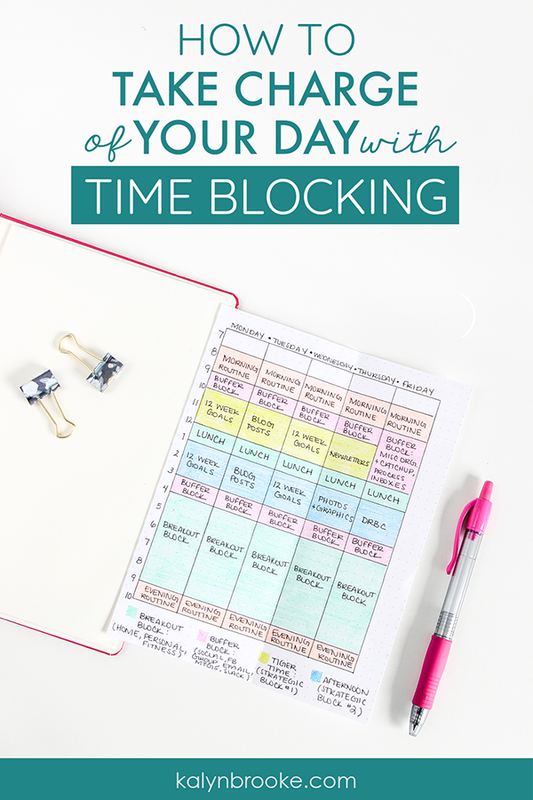 Because the goal of time blocking is to allow you to focus only on one of your “blocks” during a certain time of day, try to assign the blocks that require the most of you during times when you have the least distractions and the most energy and focus. For me, this is during 10am-12pm every day except Friday (that's when I tend to check out!). During that two-hour window each day, I work on my 12-Week Goals, write blog posts, and write my Saturday newsletter when I'm most awake and able to concentrate. Likewise, batch little tasks together that are more like busy-work for times when you feel “meh.” By 3pm, I'm losing steam, which is why I tackle things like email instead of big projects that require major attention. 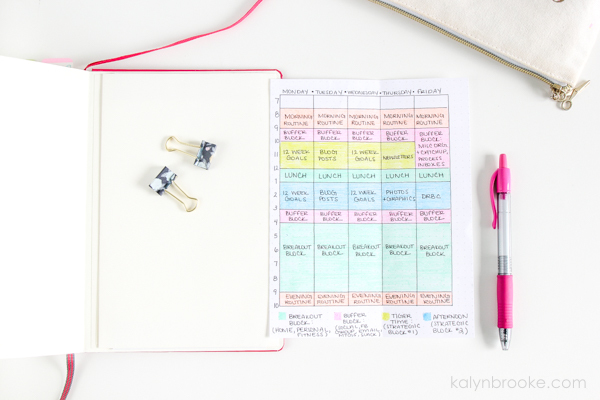 The last step is to write your daily to-do lists based on your time-blocked weekly schedule. 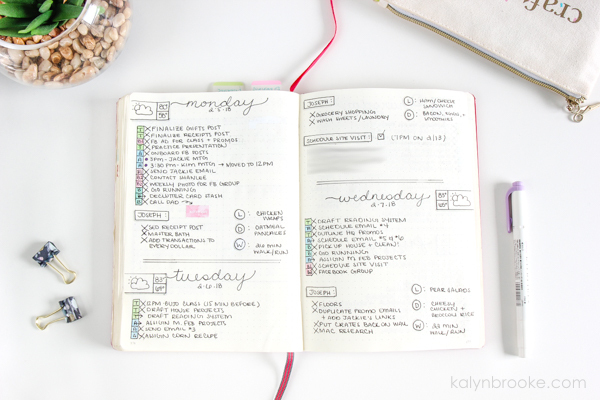 Get a planner (like the Day Designer or Living Well Planner) that already has times blocked out for you. Use a method like I do in my bullet journal where I assign a block to every task on my list. Because I don't have a pre-made planner, I jot down an overview of all the tasks I want to complete each week on my Weekly Log, then migrate them over when I create each daily layout. You'll notice that I use Morning, Afternoon, and Evening time blocks here because these are my big rocks that I need to focus on for the week. 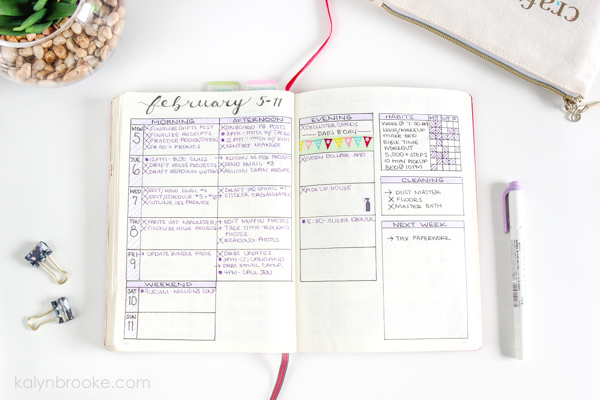 When it comes time to create my Daily Log, I assign each task to more specific time block, as well as add in some of the tasks that popped up after I completely my Weekly Log. 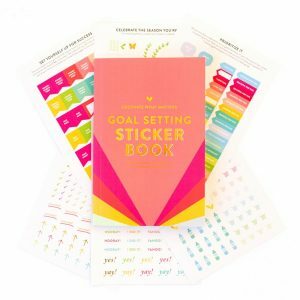 Interested in starting your own bullet journal? Check out my comprehensive starter guide HERE. The key is to plan your time according to how much you can reasonably fit into that time block. Always schedule in more time than you think the task or project will take. This eliminates overwhelm AND disappointment when you don't get everything done you thought you would! After your first successful week of time blocking, you'll quickly understand why this productivity technique is a game-changer. Instead of feeling anxious about how much you have to get done, you'll become strategic and intentional about your approach. You'll never wonder what to get done and when, because you now have an organized plan set in place. And when Friday morning arrives, you can bask in the glory of all you accomplished without spending your entire Saturday playing catch-up! Have you ever tried this productivity method before? I just bought the Day Designer for the first time I’m experimenting with all of this! I have monthly and quarterly tasks which tend to take the back burner as I put out daily fires. I have started by time blocking those tasks. It’s a work in progress but I’m positive! How do you denote meetings? Which block does it go into…standing meetings vs. meetings that come up weekly? I love this..But how do I get the printable? Thanks! Just click on “Download Now” in the article and a box will pop up. Enter your email address and the printable will be sent right over! If a box doesn’t pop up, just check to see if you have any pop-up blockers active in your browser. I wish your block timing printable started with Monday, instead of Sunday (just like your bullet journal shows). I’m sorry about that. 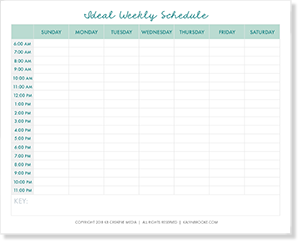 In my bullet journal I just time-blocked for the work week, but for the printable I wanted to include all 7 days for those who preferred being able to time block out their entire week, or who had different work schedules. Yes, I like that it shows all 7 days, I just personally prefer for Sat. and Sun. to be lumped together at the end of the week- even though technically I know Sunday is the beginning of the week. Just my personal preference. How could you do this for someone with a brain injury? I have never thought about time blocking! I have a fairly new blog and it just seems I have so much to do! Lol I will def be trying this out! Thank you! How’s it been working for you? Has the time blocking system been what you were looking for – or did you find another system that helped you reach your goals?